half girl, half robot – but which half? So far some of the things lost when tidied include: a boxed copy of Evil Genius (which I’ve just re-bought in the Steam sale as a download), a mobile phone and most recently the cable to connect my camera to my laptop (and also to charge my Mum’s Kobo – so yeah I’ve had to re-buy that one). And there’s no way of knowing if the lost things are just…here somewhere or if they’ve accidentally gone in the bin. The 42 black t-shirts is also me. However, I have a “black t-shirt shelf” to go with my “not-black t-shirt” shelf. It’s not quite the end of the year just yet1, but I have decided that it is highly unlikely I am going to leave the house and make the five minute journey to my local multiplex. My film logging widget tells me that I saw fewer films in total this year than I did last year and from looking at last year’s films in review blog and my letterboxd list of 2018 films, I also saw fewer new films. Was it just that there were fewer films that took my fancy released? Could I just not be bothered to go out and see them? I know there were a few that I thought “well, I’ll just wait for them to be on TV” that I can’t even remember the titles of now. I nearly said that there wasn’t a Star Wars film out in 2018 but I guess Solo counts as one of those, so it’s not even that. I could really do with a new Star Trek film – although Discovery is coming back in the new year and I am p excited for that. Long Day’s Journey Into Night – This film was really long and didn’t seem to go anywhere. Sure the 3D 50 minute long single shot take is a technical achievement but like… what was the point. I guess the first section was just too vague and I didn’t care about the main character. In Fabric – Parts of this film were entertaining but then other bits induced too much second-hand embarrassment. The Bill Murray Stories: Life Lessons Learned from a Mythical Man – I don’t know that I’m really that interested in Bill Murray’s hijinks, but it was nice to hear from people who had such good experiences and to its credit, this film is only 70 minutes long and doesn’t try to pad itself out with pointless filler. Aquarela – Ok so this film is about water and only that. Glaciers, frozen lakes, waterfalls, oceans, hurricanes etc. all to an industrial classical soundtrack. The director said that it was supposed to showcase the immensity of water on our planet but it had been a long day and the water noises along with metal-cello accompaniment were really relaxing and I might have drifted off once or twice2. The Quake – I didn’t see The Wave, to which this is a sequel to, but I don’t think I really needed to. Most disaster movies that I’ve seen tend to be all action, which is fine. This film has action, sure, but most of the drama comes from within the characters’ regular lives and their reactions to the disaster of the previous film. Which is a nice change. Ash Is Purest White – I spent 20 minutes trying to remember which of the films on the list had the ballroom dancers in and it was this one. Anyway, Ash Is Purest White kind of starts off as a gangster film, but then actually follows the life of the “gangster’s moll” character who is far more interesting than anyone else. Arctic – I actually had this one just above Aquarela but then I started thinking about it and had to move it up the list a bit. Mads Mikkelsen is exceptional in this. Solo: A Star Wars Story – This was OK. I kind of want to rate it lower but maybe that’s because I kind of expected more from a film about Han Solo and on the whole it was fine. Unnecessary maybe, but fine. I would probably have preferred a Chewie film. A Family Tour – There’s a lot here that I recognise in my own family, although of course, none of us currently live in exile from China or have suffered the kind of injustices that the main character here has. Although saying that, thinking about the race riots in Malaysia in the late 60s, I do wonder if I am wrong about that one. Duplicate – This film is called “Jonathan” in a bunch of places but I guess it must have got renamed to Duplicate. Did not go in the direction I had thought it would at all, mostly because I had no clue where the story would go from the start (but in a good way). The Man Who Killed Don Quixote – This is the only Adam Driver film I saw this year, although in a sense it was like 3 Adam Driver films in one, so I guess I’ve probably equalled last years Adam Driver film total. Happy as Lazzaro – I didn’t really know what to expect from this film and it turned out to be kind of a meditation on sainthood. Also, did not expect the direction the second half took at all, which was great. Outlaw King – I enjoy historical films with loads of violence, what can I say? Deadpool 2 – Also contemporary films with loads of violence. I feel like this wasn’t as enjoyable as the first one. Out of Blue – I guess I would compare this one to last year’s Small Town Crime, only the main character in that was a mess and Patricia Clarkson’s detective is not really. The Hummingbird Project – This was way more heart-warming than I thought a film about putting in a fibre optic cable across America would be and I am glad of it. And SALMA HAYEK plays a great villain. Assassination Nation – I really enjoyed this although I think it was trying to position itself as something more controversial than it was. Also another film with loads of violence. Basically, 80% of films I watch have violence in them I guess. Widows – This was so so good and deeply satisfying. Also, there is a cute dog. A Wrinkle in Time – I saw this so long ago, but I guess it says something that a film from right near the beginning of the year stuck in my memory and maintained its position in my chart – I often find that more recent films chart a bit higher sometimes because I remember them more. I’ve not read the book but I don’t think that’s a problem. This is a really beautiful film but wow Charles Wallace is annoying. Can You Ever Forgive Me? – I picked this film because I really enjoyed seeing Melissa McCarthy in Spy and the title sounded interesting. It turned out to be one of the best films I’ve seen this year – both funny and unexpectedly touching. The Favourite – Rachel Weisz is awesome. Her name is Rachel, so of course. Olivia Coleman and Emma Stone are also excellent, though they are not Rachels. Their performances made the characters seem real – even though they are real people that existed, the distance of time renders them as “just” characters in a story. Anyway, this was great and funny and moving and I really enjoyed it. I Used to Be Normal: A Boyband Fangirl Story – I was never a boyband fangirl myself. I just didn’t get the appeal, but I have been a fan of other things and it was a DELIGHT to watch this and feel those feels and see other people feeling those feels. Not only does this documentary tell the stories of a range of different fangirls, but it also follows the changes in their fandom and what their love of their particular boyband has enabled them to achieve. And it takes all of their fangirling and love and out-there antics and takes it all seriously. Everyone should see this. Little Forest – This is a film where a young woman spends a lot of time cooking for herself and for her friends, eating the nice food she has cooked and hanging out with a puppy and I think this is the gentle film that the world needs right now. Pacific Rim: Uprising – In contrast, I don’t think the world needed this particular Pacific Rim film (perhaps del Toro’s version would have been different) and yeah, there is one element of the story that is CLEARLY RIDICULOUS and UNCALLED FOR. That said, I enjoyed the story and the robots and John Boyega is a national treasure. Avengers: Infinity War – I am here for Captain America 5eva. And most of the rest of them too. Ocean’s Eight – This is literally the only Ocean’s film I have seen in a cinema rather than just waiting for it to be on the telly and that was an excellent decision. Sandra Bullock is my perennial fave and she and her team are just so good at all of it. Richard Armitage is there being awful in the best way. The only thing that could have been better would be if they had just put someone else in as the insurance fraud investigator. Black Panther – It feels like Black Panther came out a million years ago but it was literally only like eleven months. Everything about this film was just right and I loved T’Challa and Shuri and her being the genius little sister. And that’s it for the new films I saw in 2018. I feel like I would have liked to go to more gigs, but sometimes I’m just not interested in the people who are touring here. I visited Norfolk on holiday and that was great. I ate a great many delicious things. 2018 was okay. 1. Well, I started writing this 3 days ago. 2. It had been a long day. Author RachelPosted on December 31, 2018 December 31, 2018 Categories FilmTags film, review1 Comment on 2018 Films, mostly. I am languishing in my sickbed, riddled with plague and reading about all this Tumblr stuff. Maybe not plague. A cold. I know that the ringing in my ears is louder when I’m sick, but it’s coupled with the sound of the water moving through the radiators and hot water pipes – a similar sound to the one I hear in my ears – which makes it all worse somehow. No amount of earplug-wearing will help when it’s a noise already in my head. Coincidentally, I’m also reading about how places like restaurants are really loud. I’m constantly thinking about how loud places are and how it seems like everywhere has gotten louder but can’t really decided whether they really have become louder or I just notice more now that I try to avoid loud noises. Probably both. Restaurants are so loud because architects don’t design them to be quiet. Much of this shift in design boils down to changing conceptions of what makes a space seem upscale or luxurious, as well as evolving trends in food service. Right now, high-end surfaces connote luxury, such as the slate and wood of restaurants including The Osprey in Brooklyn or Atomix in Manhattan. This trend is not limited to New York. According to Architectural Digest, mid-century modern and minimalism are both here to stay. That means sparse, modern decor; high, exposed ceilings; and almost no soft goods, such as curtains, upholstery, or carpets. These design features are a feast for the eyes, but a nightmare for the ears. No soft goods and tall ceilings mean nothing is absorbing sound energy, and a room full of hard surfaces serves as a big sonic mirror, reflecting sound around the room.The result is a loud space that renders speech unintelligible. Now that it’s so commonplace, the din of a loud restaurant is unavoidable. That’s bad for your health—and worse for the staff who works there. But it also degrades the thing that eating out is meant to culture: a shared social experience that rejuvenates, rather than harms, its participants. And the Underground is SO loud. I mostly travel on the Northern line when I use the tube and the TRAINS are SO LOUD. If you want to talk to someone, you’d have to shout (on the other hand what are you doing, breaking the unwritten rule of not speaking on the tube). I always wonder about how loud people must have the volume for whatever they are listening to on their headphones. I think about how that kind of volume from headphones on my own ears would probably be worse for my tinnitus than the sound of the trains the music would be drowning out. At least I can wear earplugs on the train. At some point, two different things about reading ended up in my “tabs to read” window – one about skim reading and the other about reading with a pencil. She goes on to talk about we have less “patience to read longer, denser, more difficult texts” and along with that potentially comes less ability to apply higher levels of critical analysis to such texts (or perhaps also in texts we come across in every day life like contracts or wills). The second tab I’ve had open – the one from Austin Kleon’s blog about reading with a pencil made me really think about how I read. I don’t think I could ever actually write IN a book, which is also interesting to me – there are people who freely write in books they own and then there are people who would never dream of it and is there anyone in between? Marginalia means to me that I’ve paid attention to the thing that I was reading – for the essays and such that I’ve written in the past, I’ve always had to print out papers (in part to highlight them and make notes) rather than attempt to read them in a digital format. Even though I can’t bring myself to write notes in a book, the books I used for my dissertation were RIDDLED with post-it notes with various scribbles and arrows on them. I feel like I don’t read as much as I used to – I certainly don’t get through as many books as I once did. However, when I really think about it, I wonder if I am really reading less or is it that reading in a digital format somehow counts less? Instead of zipping through novels, I read fanfic, journal articles, meta, Twitter, newsletters (the satisfaction of reading a blog with the ease of it being right there in my inbox, though I never forsook RSS), the odd Livejournal/Dreamwidth entry… so am I really reading less? Or is it that I don’t have the patience for long things anymore? I know I don’t understand how anyone can binge-watch a series – I can watch two episodes tops before I have to switch to a different series. Anyway. It is a thing I have been thinking about. Tackling the Ethical Challenges of Slippery Technology – I studied software engineering and the closest we really got to thinking about ethics was the single first-year module “Philosophy of Computer Science” (or something similar). I ended up writing about whether an AI could have a soul. More recently, I was talking about AI with a priest and he couldn’t believe that we don’t necessarily know why an AI might make a particular decision – if we made them, then we must understand them right? With Henry Cavill reportedly parting ways with the DC Universe, there is currently a large cape to fill and no shortage of strapping, symmetrical-faced lads to fill it. Henry Cavill, the person whose face I enjoy looking at primarily for his partial heterochromia and because I am heartened to see that he still has teeth stereotypically common to my fellow residents of the British Isles. Of course Clark Kent can’t go down to the orthodontist to get his teeth fixed. I’ve not really got anything else this week. 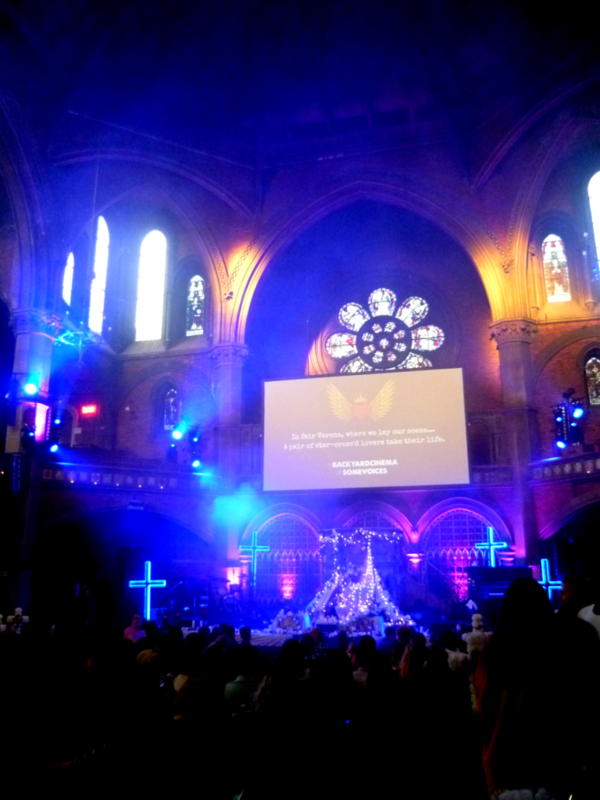 On Saturday, I went to see Baz Luhrmann’s Romeo + Juliet at the Union Chapel, with a live choir. Basically that meant that there was about half an hour’s performance of some of the songs from a choir before the film along with some dude saying various quotes from throughout the play. Then they did a song at the end and some guy in the audience then proposed to his girlfriend, she said yes, we all clapped and the choir did another song, dedicated to the couple. I don’t really get why someone would pick Romeo + Juliet as a prelude to popping the question, as so many people die and namely the “happy couple.” I am sure it was probably a nice evening for them so that must add context. Romeo + Juliet was great though. I first saw it when I was about 12 and I didn’t really get probably about half of the language used, but it’s like watching Chinese historical dramas – you don’t know what anyone is really saying, but they are doing the right faces. I guess it probably helped that I studied the play at school afterwards and I’ve learnt a bit more about Shakespeare and that since then. Watching now, over 20 years after the film was released, and looking at 20 years ago Leonardo Dicaprio and Claire Danes was kind of weird. I guess when I first saw it, the actors were like 5-10 years older than me and I was just watching stuff happening to people. Watching now, looking at 21 year old Leonardo and 17 year old Claire Danes, from the viewpoint of someone now in their thirties and like… they are really dramatic children. I know in Zeffirelli’s version, Romeo and Juliet are played by even younger actors – but they’re not in a relatable modern setting. I’m sure I must have written an essay about this in school, but man those kids needed some responsible adults in their lives who didn’t enable their nonsense. It wouldn’t be quite so entertaining a play though. What else? I think that’s all I have.